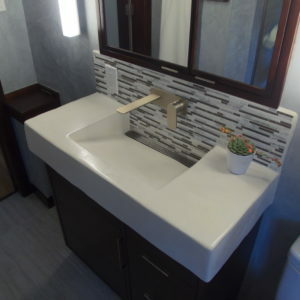 We install a lot of tadelakt showers, walls, sinks, and back-splashes. We even teach workshops on the process as a part of a couple of natural building and plaster workshops and internships. Plus, we all have a lot of love for the craft. 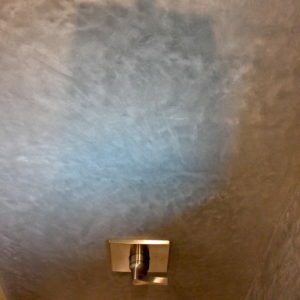 It is one method of creating a polished plaster, which is specifically valued for its water resistance. 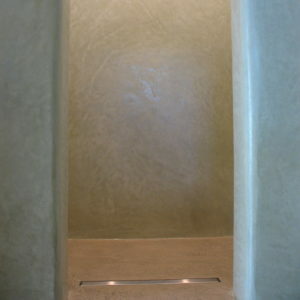 Other countries have their own similar methods like venetian plaster in Italy and tosa shikkui in Japan. While they are indeed similar, the local materials, tools, history, and other variables makes each vary slightly. We learned our craft here in Colorado from our mentor, a skilled tadelakt applicator who trained in Morocco. 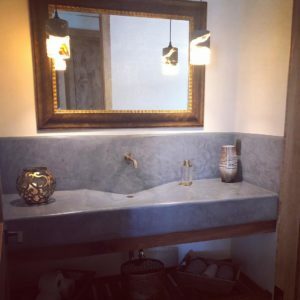 Tadelakt started out as a traditional finishing for Moroccan cisterns and baths. Moroccan plaster artists have been practicing this technique for over 1000 years! Craftspeople would burn limestone found in the mountains around Marakkesh to create a powder. This lime reacts when mixed with water to create the plaster mix. 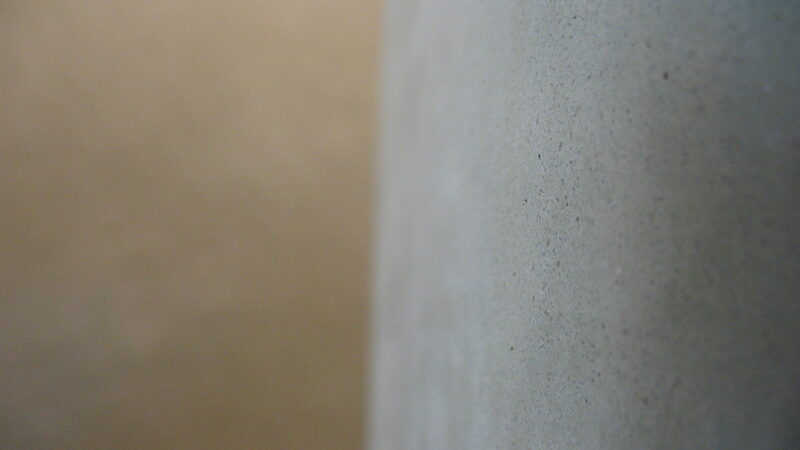 Tadelakt is made with a rich, fine lime plaster, but it traditionally contains some limestone impurities. Because lime we buy here is screened for a pure consistency, we need to add in limestone and marble based aggregates to balance the pure binder. We screen our aggregates to make sure the plaster is smooth and goes on thin. 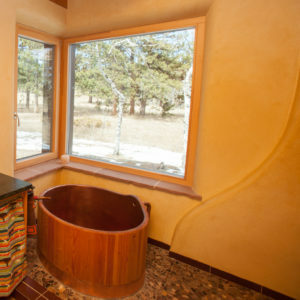 Creating a tadelakt wall, ceiling, sink, or tub is a time consuming process. Everything starts with a solid backing. Tadelakt can go over cement board, drywall, lath and plaster, or brick, cement, or stone. 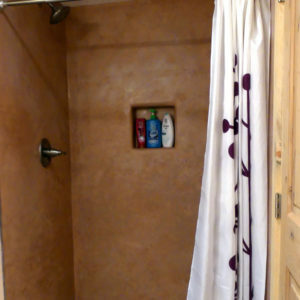 For showers, sinks, or tubs, we create a fully waterproofed seal over this surface. This ensures the longevity of both the home and the plaster. The process to install tadelakt is complex. First, it requires 3 base coats, to bond the plaster to the wall and provide a good surface for the final layer to adhere to. Next, we apply the tadelakt, which requires 3 successive passes with thin coats of plaster. Then, we burnish the plaster with hard trowels and/or small, smooth stones to create the shine and smooth finish associated with tadelakt. 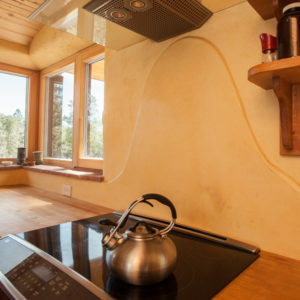 An olive oil soap mixture seals the plaster and starts a chemical reaction that creates soap scum – or calcium stearate – a natural wax that’s embedded in the wall to provide the water resistant finish. 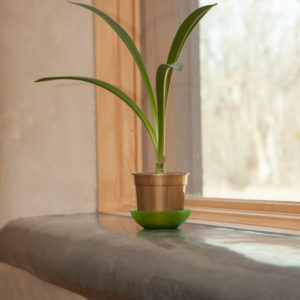 Because of the dry Colorado climate, it’s important that the finished product has time to dry slowly – so keep windows and doors to the area shut on hot and dry days. Finally, after 3 weeks to 1 month of curing time, we soap the plaster once again to remove any surface dust or contamination, and wax it to provide a sacrificial layer of extra protection. 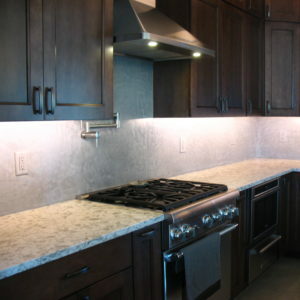 Take a look at some of our completed tadelakt projects in the Denver, Boulder, and Ft. Collins areas of Colorado.